Monday marked the calm after a particularly pleasurable storm as Speyside took a breath at the end of another non-stop Spirit of Speyside Whisky Festival (SoSWF). Martine Nouet was there for the duration. Anyway, these inquiring visitors will probably have missed many distilleries during the festival. How can you be everywhere when you have to choose between 500 events on a five-day menu? And yet Cardhu was still busy this morning, offering the ‘Big Cardhu theory’ with a three-hour tour and tasting hosted by the charismatic Andy Cant, who looks after Cardhu and two other neighbouring distilleries. 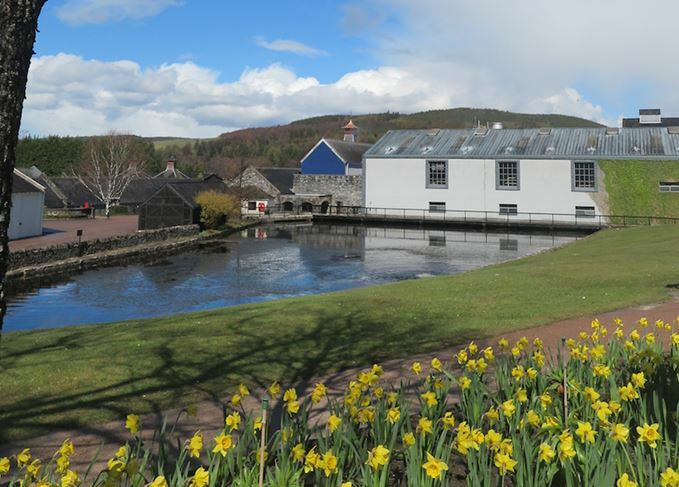 Dufftown, on the other hand, seemed to be back to its legendary, relaxing lethargy on Monday. Again, Glenfiddich’s car park was nearly empty, and the clocktower was no longer the gathering-point of dozens of whisky aficionados. It wasn’t like this on Sunday. The ‘Highland capital of whisky’ was buzzing with the Whisky Fair, and the Whisky Street Festival in the High Street, featuring a barrel-rolling competition and the unmissable Dufftown Pipe Band Parade. Dufftown Hall did not attract foreign visitors only. It was pleasant to talk with locals who had decided to give a serious go to independent bottlers’ samples, all in a friendly atmosphere. I was impressed by the Iain Burnett Chocolates stand and I was not the only one, judging by the cluster of people determined to taste all the chocolate available, each offered with a specific dram: an orange and clove ganache with Dalmore 12-Year-Old; lime and lemongrass milk chocolate and Glenkinchie 12-Year-Old. This gourmet chocolatier from Grandtully, near Pitlochry, has done a serious pairing job, drawing up a list of up to 100 single malts matched with a specific chocolate. Certainly the best chocolate and whisky experiment I have come across. The Whisky Shop opposite the clocktower has been crowded from morning to closing time. On Sunday afternoon, Hunter Laing’s Old Malt Cask range was available for sampling. The evening’s Whisky Awards Ceilidh 2016 included an excellent band called Tweed. The full range of Scottish dances was executed by an experienced audience, as swift and energetic as teenagers; and yet, a good half of the dancers were far from being spring chickens. It was a real delight to watch them swirl to the frenetic sound of the fiddle and the accordion. Special congratulations to James Campbell, chairman of the festival, who did not miss a single step. The SoSWF is not only about whisky. It is also an open stage for music and a rich table. Whisky, dance, music, food... the best ingredients for fun. I could read a look of incredulity in the eyes of some of the participants in the Vintage Music and Vintage Glenrothes tastings on Friday and Saturday. Enjoying Glenrothes 2001 while listening to the famous Libiamo ne’ lieti Calici aria of La Traviata, sung by Maria Callas, was somewhat intimidating and certainly unusual. But more challenging was sampling Glenrothes Sherry Cask Reserve to Back in Black from AC/DC. Out of the box, yes, but Ronnie Cox's force of persuasion and mischievous sense of humour put aside shyness and inhibitions. It was a real pleasure to hear the humming and see people wiggling on their chairs. Music and whisky could be one of the fresh trends of sensory evaluation after whisky and food, which has now become a regular feature. For many a festival-goer who was lucky enough (and could afford it), the Drummuir Castle and Mortlach Distillery event on Saturday was a very special treat. It included an in-depth visit to the distillery, but also a special reception at Drummuir Castle, where the participants were offered special drams in different rooms (so that they could dream for an afternoon that they were permanent residents in the castle). Can you imagine a better place to discover Mortlach 25-Year-Old than in the candle-lit wine cellar, accompanied by the appropriate canapés? And what about having an open dram cabinet session in the library, inviting you to choose from the entire Diageo portfolio? No wonder, then, that SoSWF attracts people from 36 countries, most of them coming every year with the same enthusiasm. Glenfiddich ticked every box in the Spirit of Speyside Whisky Festival Awards. It won the 12 years and under category with Glenfiddich 12-year-Old, 13-20 with the 18-Year-Old, and the over 20 with Glenfiddich 21-Year-Old Gran Reserva. The public was invited to vote between two contenders in each category throughout the festival. Meanwhile, Best New Event was won by The Blackening at Speyside Cooperage. A bottle of 21-year-old Glengoyne Scotch whisky sits inside the huge, handmade chocolate egg. The life of the determined creator of Glenfiddich, Balvenie and Scotch’s biggest family business. Independents dominate this collection of single malts, with an old Littlemill to the fore.